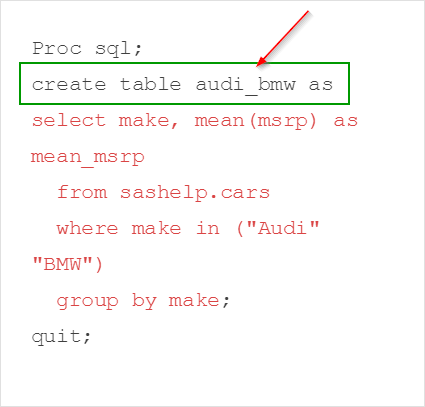 A SAS table can also be created using a Proc SQL query. 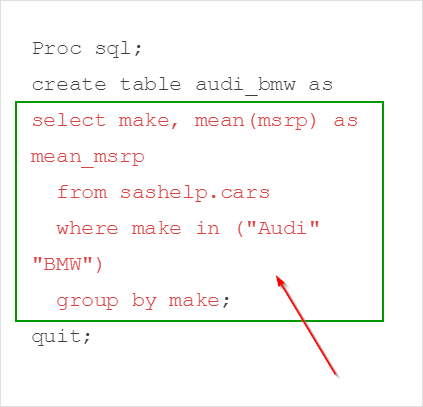 In this example, the CLASS table is created from the query that selects all of the rows from the sashelp.class table. 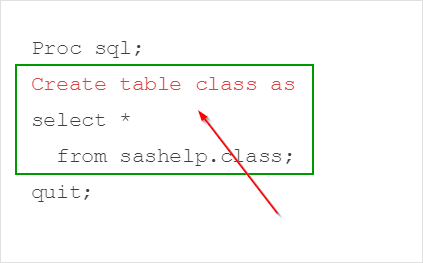 The CLASS table is created as a carbon-copy of the sashelp.class table. 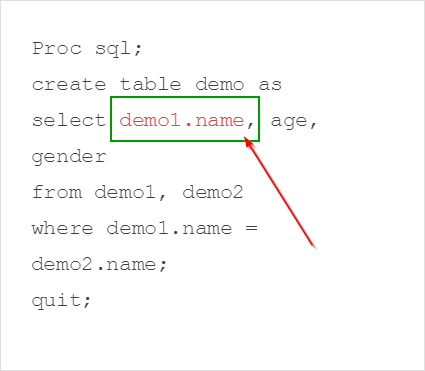 In Proc SQL query, you are allowed to create two columns that have the same name, as long as no SAS table is created. When creating an actual SAS table, SAS does not allow columns with the same name to exist in the same table. You must rename or drop one of the columns before creating the table. 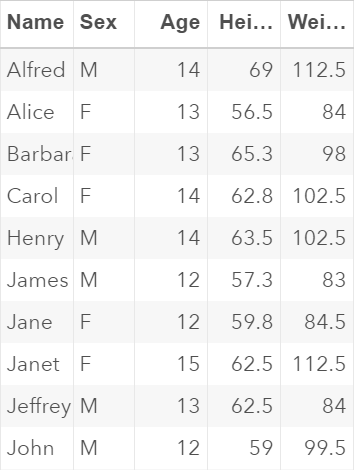 The DEMO1 and DEMO2 tables contain the age and gender information about John, Mary and Peter. Note: the query itself does not create an actual SAS table. It simply displays the result in the output. In addition, there are two NAME columns in the output. Now, let's create a SAS table using the same query. WARNING: Variable name already exists on file WORK.DEMO. The issue here is that SAS does not allow tables to have two columns with the same name. One of the columns is automatically removed. One way to resolve this issue is to manually select the column to be included in the output. You will have the same result as before. However, there will be no warning message on the SAS log. Locate the SHOES table from the SASHelp library. Write a Proc SQL step to compute the average sales for each product (e.g. boots, men's casual, men's dress...etc.). ​Save the result in a SAS table and name the table as AVGSALES.